I first introduced you to My Greeting Box back in Summer, when they put together the sweetest fairy themed box. Now that we're in October they've taken a spooky turn and curated a special Halloween edition. It was posted out on the 10th October and arrived shortly afterwards, giving me plenty of time to make my cards and give them out before the big day itself. The box was securely packaged and fit through my letterbox, but its small size certainly didn't reflect the contents. It was jam packed! Just like before, the box is incredibly well thought out, with a clear theme running through it. Everything was orange, purple, green, and black- all the classic Halloween colours. There were even miniature orange sweets included as a treat for you to enjoy or give with the cards. To see my reaction to the goodies inside and a full description of them all, click over to my unboxing video. The Unique Selling Point (guess who's been watching too much of The Apprentice) of My Greeting Box is the instructions that arrive with the supplies. There is a picture on the front to illustrate exactly how your finished product should look, and inside you'll find detailed steps complete with diagrams. 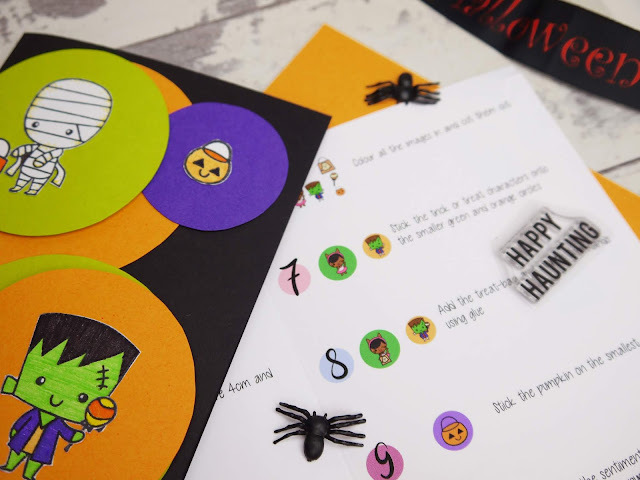 This month we had the cute mini monster pictured, a cleverly layered card with its own door which swung open to reveal trick-or-treaters, and even pre-cut nets to fold up your own tiny treat boxes. I was especially pleased with this inclusion because it's not something I would have expected at all. Each card requires you to use a few different skills, so it's an enjoyable way to learn or hone your skills. The thought behind each one is clear to see, and the interactive layers and levels not only make them fun to make, but fun to receive, and much more special than any you could find on the high street. Although the steps are simple, there are quite a few of them, so you can expect to relax and enjoy making each one for 10-15 minutes. I found working through them and focusing on the task at hand was really calming and a great activity to do when I wanted some time away from screens. If you're a parent of a teen, this could be an excellent way to get them to follow suit, but you could also get younger children involved in the colouring and sticking elements to turn it into a family activity. My Greeting Box are still running a 25% discount off your first box, so there's no better excuse to order it and spend the chilly November days crafting to your heart's content. 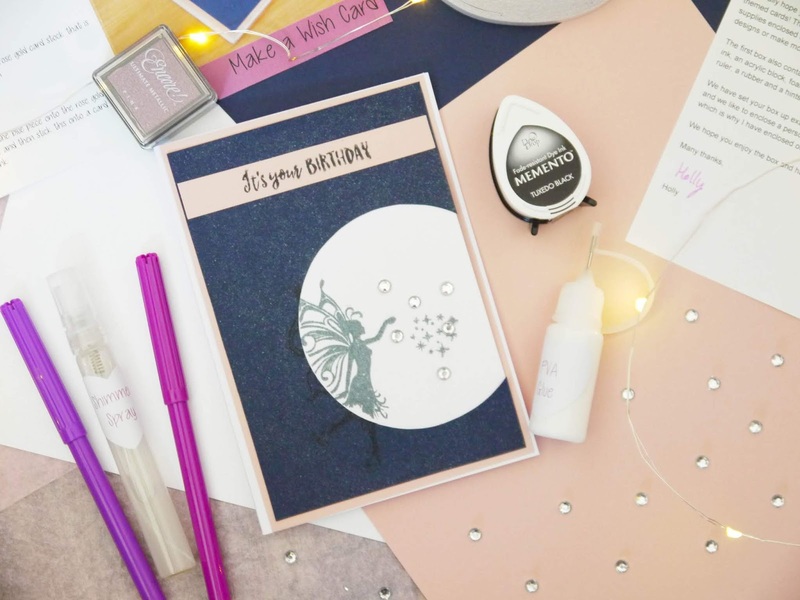 Have you tried cardmaking before? This box was sent to me in exchange for honest review. When I worked with elderly people, one of my favourite activities to do with them was card making. No matter the level of imagination or ability, everyone can make something beautiful when the intention is to send it to someone and make them smile. Part of the reason I enjoyed it so much is because I worked in a facility which had an entire wardrobe dedicated to art supplies, so I didn't have to choose what to buy, and there was a huge selection to suit everyone. It made it so easy and enjoyable to just lift the boxes out and let everyone dig in. My Greeting Box* is like a refined version of that. If you want to try your hand at cardmaking it can be overwhelming to see all the techniques and products available, not to mention costly, so the lovely owner spotted a gap in the market and started putting together boxes with everything you need to get going, including stamps, embellishments, cards, and so much more. With your first box you even get the essentials such as a ruler, rubber, pencil, tape, glue, and an acrylic block for your stamps. They really do think of everything! Each month there is a theme, and the June box was based around fairies and magic. You can see from my unboxing video just how much this excited me! I love the stamps with the sweet sentiments, toadstool, and watering can, and I'm also a huge fan of the colours that were chosen. 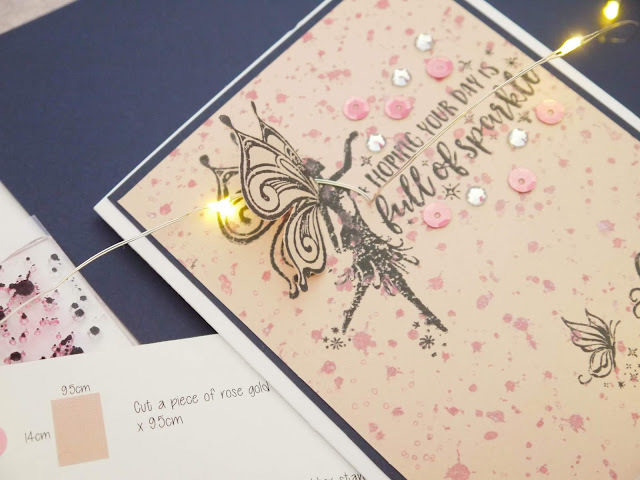 Fairies are usually aimed at children, but thanks to the chic navy, pink, and white theme these cards are suitable for any recipient and look really elegant. As I made the cards, it was easy to see how much passion has gone into them. It's not a random selection of products, but carefully planned and developed components. I was thrilled to see that Holly had packed in some really clever items, like a glue bottle with a precision nozzle, and the most amazing shimmer spray that's filled with microfine glitter to give your card that finishing touch. It truly is like fairy dust! The instructions were also planned perfectly, easy to follow and with no problems or errors. Crafty as I am, I wouldn't have thought to use the cut out technique, or layer the fairy's wings to give a 3D effect. It's so simple yet really effective, and makes your cards look so high quality. 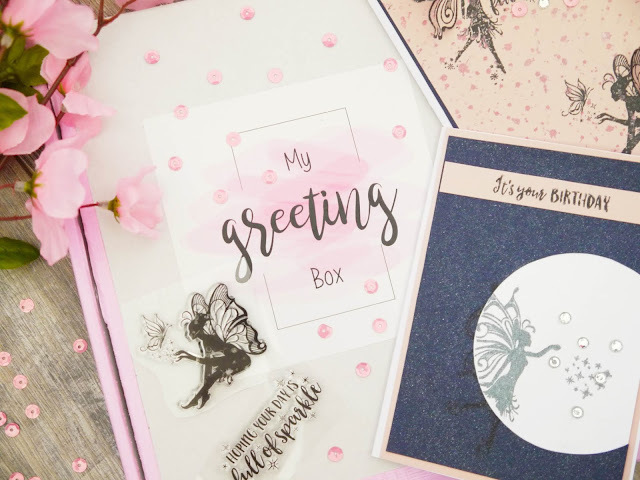 My Greeting Box are currently** running a deal where you can use the code FIRST25 to receive 25% off your first order and buy your first box for £16.50. 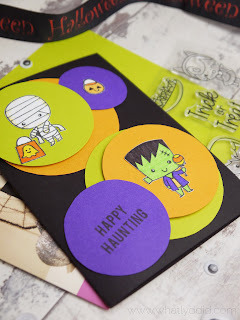 For all the essentials included plus the themed cardstock, stamp sheets, and embellishments, that is incredible value. In my eyes, you're not only buying the art supplies, but 3 art lessons in the form of the instruction cards, and a few hours of art therapy. Once the cards are made, you can use the remaining supplies for future projects, and you have beautiful handmade, sentimental cards to give. There are only a few things that help my anxiety, and art is one of them. There's just something about crafting and creating that soothes the soul, but when you're starting out it can be hard to know what project to start, or what materials you'll need. Luckily, Crafty Creatives subscriptions can send you a box every month with a complete project inside, making it so much easier for you to get making. I'm very creative, and even I gasped when I opened my box* and saw this month's project. 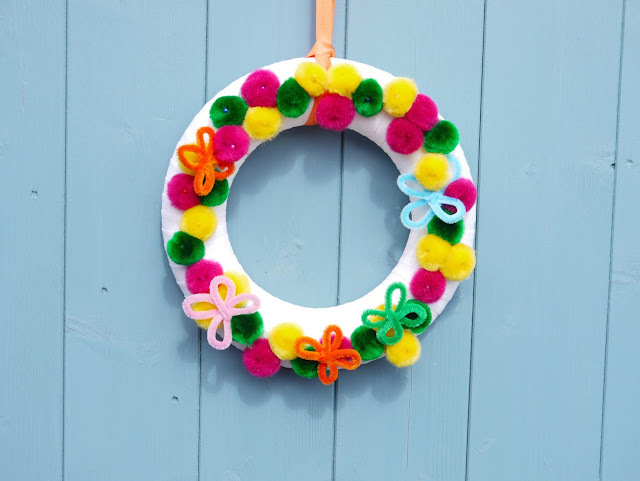 I'd never thought of making a Spring wreath! I was even more impressed when I opened the package and realised just how much is packed in every box. In addition to the foam base, I received tonnes of pom poms, 3 full skeins of coloured raffia, a full pack of pipe cleaners, a wheel of pins, and more besides. They certainly don't skimp on materials, meaning you'll have some left over for your craft collection. I was especially pleased to see the pins in the box. 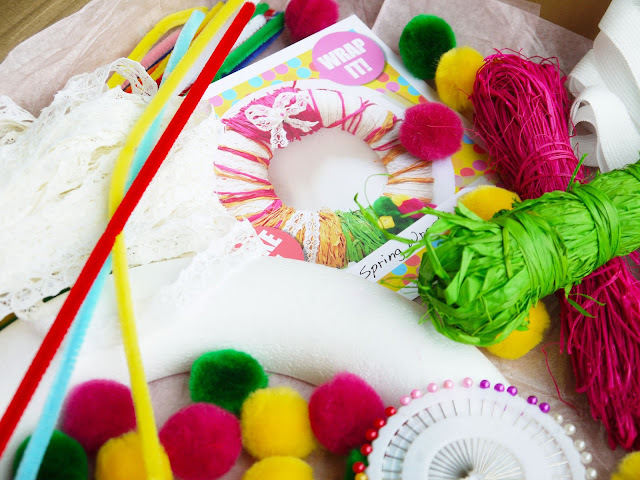 Not only do they allow you to test out your designs, they hold pom poms on much more securely than household glue. When it's time to retire your wreath you can simply unpin everything and recycle it all. I was really impressed that Crafty Creatives had thought this through and included the pins. Among the materials is a simple card introducing the project and how to share it, but interestingly there are no instructions or guide. I appreciated Crafty Creative's approach because it encouraged me to use my imagination, have time away from a screen, and removed the pressure of trying to follow steps or pictures exactly. For those who would prefer guidance, there is a link to a Pinterest page for inspiration. The boxes would make really wonderful, unusual gifts for any crafters in your life, or anyone going through a tough time. 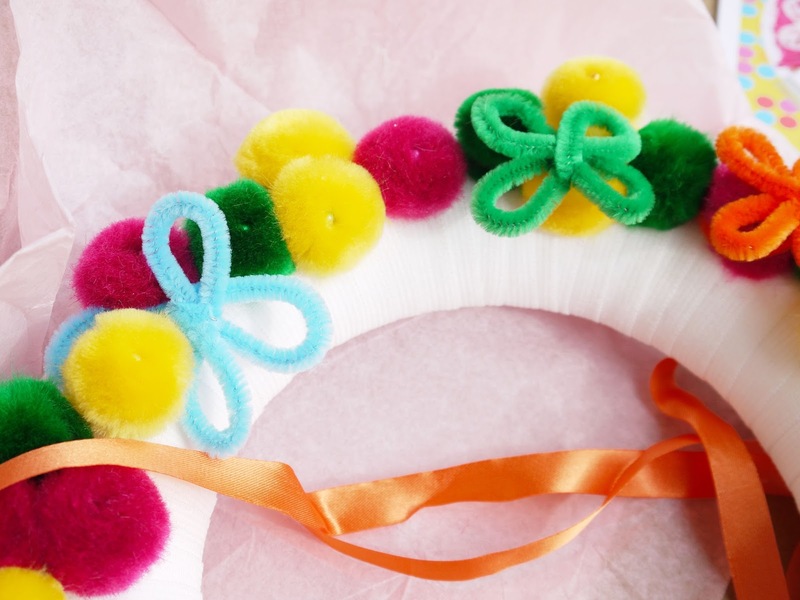 I really did feel calm and relaxed while making the wreath, and I believe that anyone would benefit from crafting. Focusing on wrapping it neatly and arranging the pom poms gave my mind a focus, and I was rewarded with the completed wreath to decorate my door and make me smile. There was no mess or preparation involved and I didn't even need scissors or glue for my design, I simply started straight out of the box. I'm really impressed with Crafty Creatives. I love that they think of everything and obviously put a lot of care and effort into making a box that's fun, easy, and rewarding. The subscription costs £15 a month with £3.20 posting and packaging, and they're worth every penny in my opinion. Each box gives you the enjoyment and relaxation of crafting, a finished product to display, and plenty of pieces to keep crafting. What is your favourite craft? *my box was gifted for review, this does not affect my opinions or honesty.